Amoy is delighted to announce the arrival of four new products into authentic oriental stores across the UK. The four new products are: Gold Label Light Soy Sauce 500ml, Gold Label Dark Soy Sauce 500ml, All-Purpose Marinade 450ml and Black Bean and Garlic Sauce 370g. All four sauces are made in Hong Kong, where they are already market leaders. We are confident that they will also be popular with Chinese consumers in the UK. A promotion accompanies the launch, offering consumers a free 500g bag of Tolly Boy Long Grain Rice with any purchase of these new products. Amoy Gold Label Soy Sauces are premium sauces, perfect for adding to stir-fries, or to use as a marinade or dipping sauce. Both are made using Canadian non-GMO Soya beans and provide a superior taste through natural fermentation. Amoy All-Purpose Marinade is made with first extract Canadian non-GMO Soya beans. It has a rich, soy aroma, giving a sweet and savoury taste with full-bodied colour. This variety is perfect for marinating many dishes, such as cuttlefish, ribs and the highly popular chicken wings. 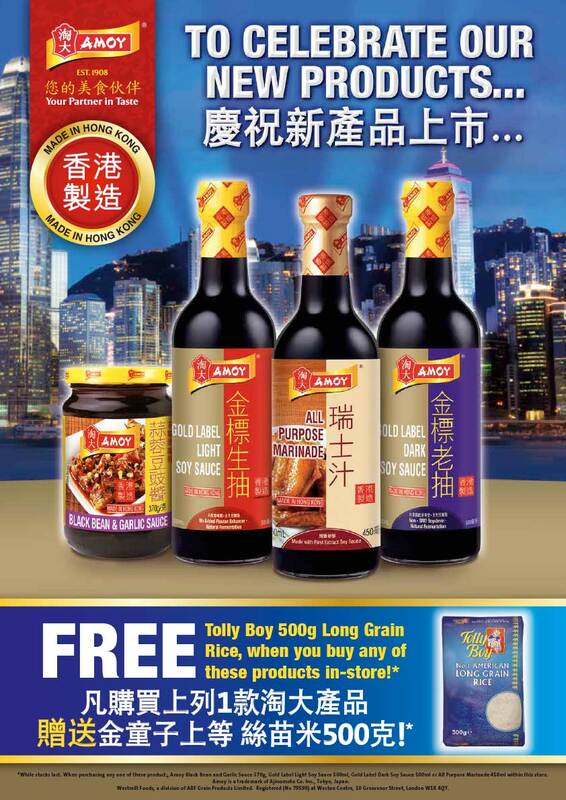 Amoy Black Bean & Garlic Sauce top grade salted black beans and garlic give this sauce its strong, natural aroma. It contains healthy and flavoursome rapeseed oil and is ideal for stir-fries and sauté dishes.